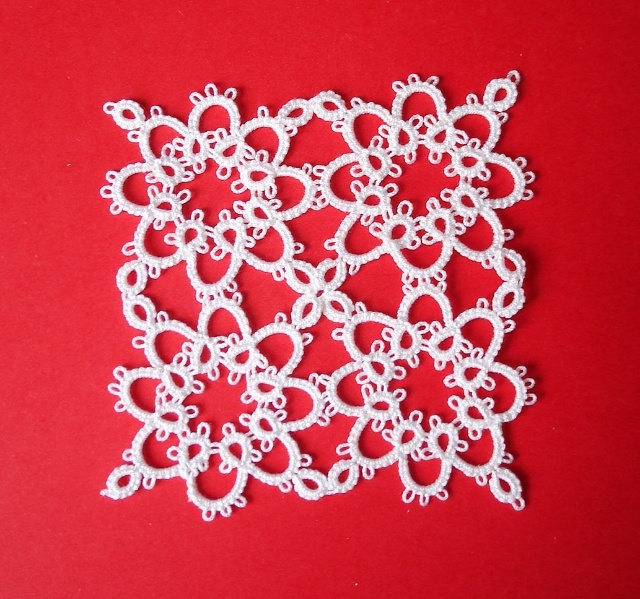 Remember I tatted a little square motif, then started to make more and join them as I go? I finally made 14 squares, and I hope that, folded in two, it will cover an iphone 6. 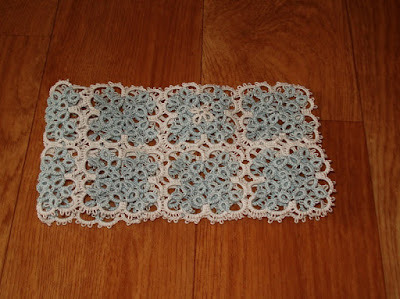 Otherwise I will have to make an extra edging. I still need to find a way to close the sides, with a row of rings, or a sort of rope ? 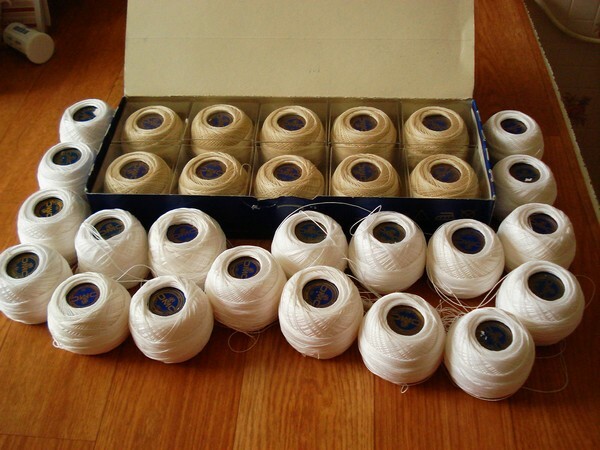 Yesterday morning I went to the local market, and they have a big haberdashery stand. On a first look, all they had was generic big balls of size 20 thread. 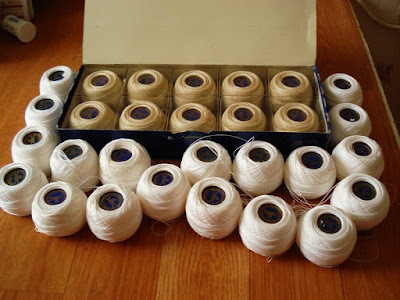 But talking to the sellers, I told them that I was looking for fine thread for tatting, and the husband came with a box of 10 DMC cordonnet special, size 30, and an extra bag of 19 balls of different sizes from 100 to 30. They sold all the 29 balls to me for 30 euros. Do the math, it's just a bit more than 1 euro the ball. I searched the net, and one ball of those is usually sold for 7 to 9 euros. Not to mention that you can't find them in shops. You can wonder how DMC threads are so hard to find in France, their country of origin, and so expensive, compaired to other countries. 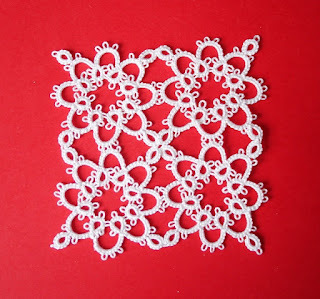 Anyway, I now have loads of thread for my tatting. 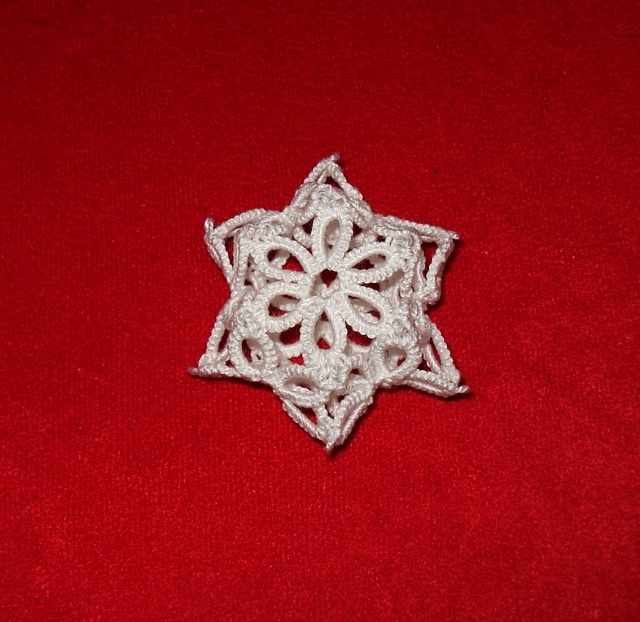 And I made a little scale thingy, the same flower tatted with the different thread sizes. I thought it could be handy at some point. 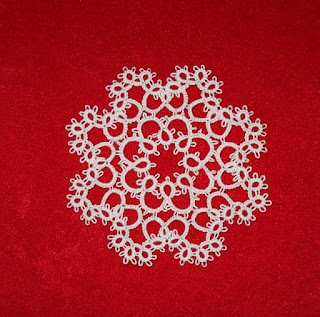 Here is the 3d star made of 8 flowers. 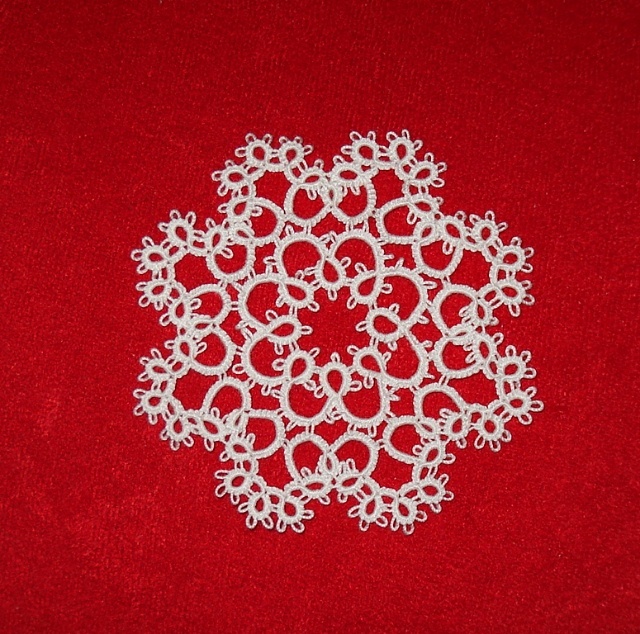 It's quite big, I used a size 10 thread, but I think it's the perfect size for the Christmas tree ! 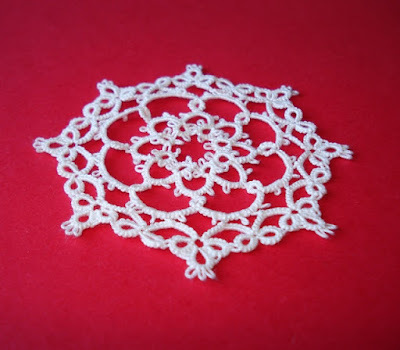 At the beginning, I wanted to make the amulet bag in my japanese tatting book. But one square is 4cm by 4 cm, not big enough for a bag or even a pouch ! So I decided to make several. I don't know how big it will end up. I am making it in two colours because I started loading one shuttle with blue cotton size 20, but all the other shuttles were full, so I took a size 20 white thread. I think the effect is nice, even if the squares make me think of"petit beurre" biscuits ! I've been crafting for so long I have loads of bits and bobs in my crafty boxes. 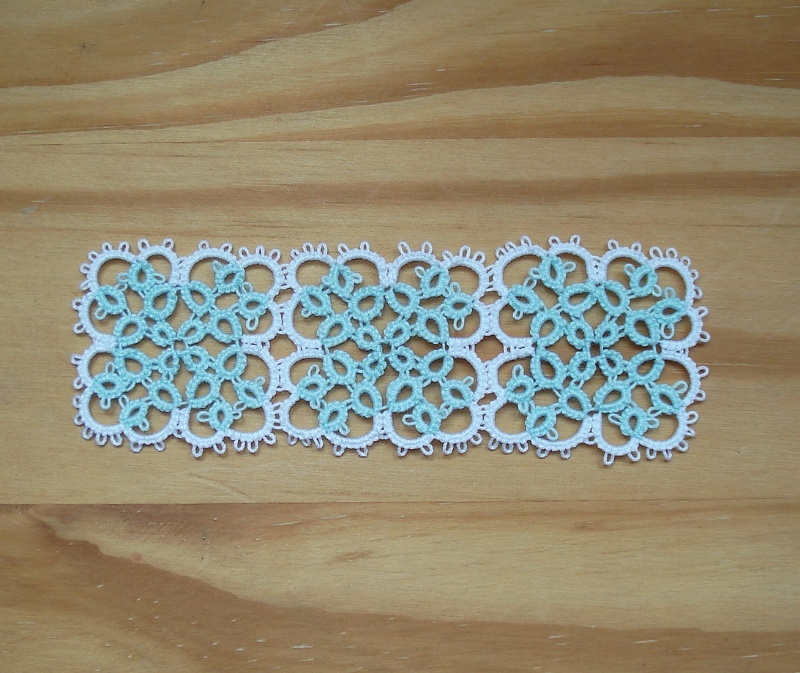 And sometimes it's even finished stuff like this tatted rosette. I have no idea when I made it, but it was years ago. and brings her tatted bag with her ! I made this cute little tatted bag and gave it to my mom for Mother's day on Sunday. She has a collection of miniatures, and the bag fitted right in. I sew a little flower I had made some time ago. I wonder who would recognise the doll. 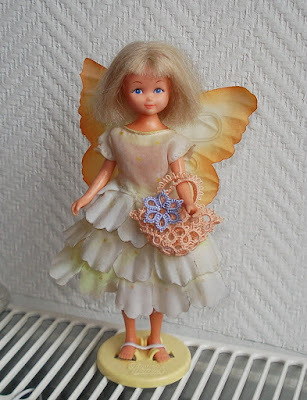 When I was a little girl, they got a collection of "Flower fairies", dainty dolls with cute dresses and wings, about half the size of a Barbie. I got my first one in York, UK, in this tiny toy shop that looked like a fairytale. Then I sold them in Belgium and I got a few more.